Relax and unwind with Kneipp Sweet Dreams Herbal Valerian and Hops Bath Oil, a soothing bath formula that helps promote a good night's sleep. Infused with concentrated essential valerian oil, lavender oil and hops essences harnessed from pure and natural sources, the bath soak helps to ease away daily stress and tension whilst nourishing the skin. When blended into water, the formula delivers naturally soothing and relaxing properties to inspire the most peaceful, deep sleep. Perfect for an evening soak after a long day. Free from parabens, mineral oil and artificial fragrances. For a full bath, fill cap and add to running bath water (97-100°F / 36-38°C) and enjoy the bath for 15-20 minutes. For approx. 10 full baths. To avoid discoloration, add bath oil to running bath water and use water to immediately rinse off any undiluted product in direct contact with objects (e.g. tub, tiles, shower partition) or skin. After the bath, rinse tub with hot water and immediately remove any product residue. Do not ingest and keep out of reach of children. For external use only. Glass bottle. *Please note: this INCI-declaration is corresponding to our current production status. Thus it can occur that previous product versions with different INCI-declarations are also available. 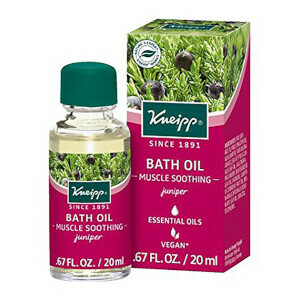 Receive a FREE Kneipp Herbal Bath Juniper when you buy 2 or more products.